Scientists working for IBM have, for the first time, captured images of individual atomic bonds within a molecule of graphene (a one atom thick sheet of carbon atoms). 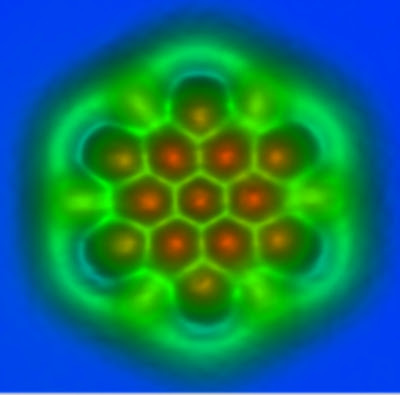 Created with an atomic force microscope (AFM), the image shows a nanosized graphene molecule (a little flake of graphene) and clearly visualises the bonds in the molecule. Interestingly, the image shows that some of the bonds are longer than others. The bonds at the centre are shorter than those on the outside, which contain viewer electrons. The scientists say the imaging technique will help them understand more about graphene - a magic nano material which may have thousands of uses. AFM works by passing over a tiny oscillating tip over the surface of the material being scanned. The tip then measure the forces between the itself and the sample, such as a molecule, to create the image. The same technique has been used to capture an image of a single carbon monoxide molecule. The AFM devices are incredibly sensitive and must be carried out at a temperature close to absolute zero, around -268 degrees Celsius. The research can be applied to created Organic Light Emitting Diodes (or OLEDs) which could be used to create ultra thin TV's or mobile phone screens. The research will also help in the development of organic solar cells and other electronic devices. It will also lead to greater understanding of chemical reactions. For more information on this cool discovery and technology, click here or here for loads of pictures from the research team. The paper was published in the journal Science.